DCLP hasn't added a story. There are still 59 people facing multiple felony charges after being mass arrested during the Inauguration Day protests on January 20, 2017 (J20) in Washington, DC. After an initial "felony rioting" indictment (which is already unusual), prosecutors pushed for a series of revisions—pulling in more defendants and bringing each person's total charges to a staggering 7+ felonies and up to 61 years in prison . In December 2017, 6 of the 194 defendants were acquitted in the first trial. Then, in a surprise move on January 18, 2018, the US Attorney’s Office announced the dismissal of charges against 129 of the remaining 188 defendants. The charges dismissed were done so “without prejudice,” though, which is a legal term that means the Trump administration can re-file charges at any time at its discretion. And the Trump administration is still proceeding with its prosecution of 59 defendants, with trials starting in May and going throughout the year. We see the narrowing of the defendant pool for what it is: a scare tactic and renewed effort to try to secure as many convictions as possible. Under dubious and flimsy legal standards, prosecutors under the Trump presidency are attempting to turn protesters into felons and working to set dangerous legal precedents for all those who work for change. These cases have disrupted the lives of the J20 defendants, who have lost jobs, incurred legal expenses, and been forced to make repeated trips to DC. Despite these circumstances, there has been an astonishing display of solidarity—with almost two hundred people committed to fighting these charges. These defendants are investing in collective legal strategies when possible, using solidarity and mutual support to keep each other safe, and are choosing to go to trial and fight the charges instead of accepting plea deals. We have the collective power to do everything we can to stop the Trump administration from destroying the lives of these defendants, people who could just as easily be you or me or your friends or family. And who will be next? Already there is a bipartisan effort to have the Department of Justice classify activists who manually shut down tar sands pipelines as “domestic terrorists.” But we know who the real criminals and domestic terrorists are. What we allow the Trump administration to get away with in these trials will affect all who fight for a better world. These prosecutions are historic. But, this is also our opportunity to make this a historic defeat for them. Your financial support is needed and endlessly appreciated—will you join this effort? Funds will be used for legal defense and to support defendants during trial, funding housing, travel expenses, food, and other support needs as agreed on by the DCLP and J20 Finance and Fund-Raising Working Group. 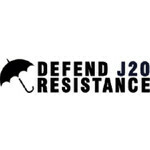 For more information about the legal defense effort and transparent accounting of how the money is being used, please visit defendJ20resistance.org. Please donate to this historic fight! Prosecutors in these cases have demanded vast troves of website data involving millions of unrelated people, sought warrants forcing Facebook to silently hand over data without notifying users while attempting to skirt legal due process, and extracted terabytes of personal data from any defendant’s cell phone that was unencrypted. They also raided an organizer’s home in DC, and defendants have had their personal information leaked online. At the same time, the prosecution requested a rare "protective" order to keep defendants from sharing police body camera footage—shielding the police from public accountability and complicating efforts to prepare a defense. Perhaps most disturbingly, prosecutors have balked at their basic, constitutional duty to disclose individualized evidence—citing the workload of so many cases (which they created in the first place!). These cases could set dangerous legal precedents, with widespread implications for all those who resist, march, rally, protest, and organize across the continent. It means that at any demonstration, if someone commits an illegal act (perhaps even a police provocateur), then the entire demonstration could be subject to conspiracy charges in addition to the wanton police violence that so often happens in the streets. On January 20, 2017, tens of thousands of people converged in Washington, DC, for protests to oppose Trump’s inauguration. A combination of blockades, marches, and festive demonstrations shattered the spectacle of a quiet transition of power, making it clear around the world that people do not recognize Trump’s authority. What could have been a day signaling resignation and defeat became a moment of defiance and resistance. As such, the protests on J20 set a tone and precedent for the events that unfolded shortly after, including the notably successful, mass direct actions at airports against Trump’s Muslim ban as well as ongoing resistance to deportations. While Trump and his Far Right foot soldiers have encountered few meaningful obstacles from liberal politicians in the halls of power, grassroots resistance has continued to prove a substantial force. Unfortunately, with resistance comes repression. In addition to shooting pepper spray and concussion grenades indiscriminately at protesters, including children, the elderly, and people with disabilities, DC police cordoned off an entire block and mass arrested more than 230 people in an attempt to stop an anticapitalist and antifascist march. While mass arrests are not unheard of, in this case arrestees were originally charged with felony riot—a charge that potentially carries ten years in prison. On April 27, the prosecution announced additional felony charges against the entire group: inciting to riot, rioting, conspiracy to riot, and five counts of property destruction. With these heightened charges, the state is trying to set a precedent for harsh crackdowns of disruptive protest in the future, so that Trump can proceed with his agenda unimpeded by anything but symbolic hand-wringing. This strategy corresponds with a broader wave of repression and reaction, from the arrests and grand jury investigations of indigenous water protectors at #StandingRock, to backlash against #BlackLivesMatter and black-led organizing against the violence of policing. The arrests at J20 also inform local strategies for repression, including antiprotest laws that have been proposed in eighteen different state legislatures, further criminalizing commonly used tactics like highway takeovers and in some cases making it legal for drivers to knowingly hit protesters marching in roadways. The charges against the J20 defendants are an experiment. If the courts are able to successfully prosecute those arrested at J20, this will send a green light to the forces of repression seeking to contain, control, and eliminate social movements around the country. Just as all our struggles are connected, we understand these arrests to represent a real threat to all efforts toward egalitarian forms of freedom, dignity, and mutualism. DCLP hasn't posted any updates yet. DCLP is managing the funds for this campaign.